...that 343 Guilty Spark was created from the mind of a prehistoric human named Chakas? ...that rumbledrugs are chemicals which temporarily grant their user superhuman abilities? ...that the UNSC Hopeful is one of the oldest and most revered ships in the UNSC fleet? The holotank, also referred to as a holo-projector, is a device used to project a hologram. Small holotanks commonly used by AIs are often referred to as holo-pedestals, while table-sized ones are known as holotables. Most UNSC ships and facilities are equipped with holotanks to display information such as tactical readouts, holographic communiques, or mission recordings. UNSC holotanks vary greatly in size and shape, ranging from small cylindrical pedestals reserved for AI avatars to large tables used to display tactical information on the bridge of a warship, for example. The Covenant commonly use holotanks on their starships, and they are plentiful in High Charity as well. AIs can also access the map data from the holotank's link to the Covenant information network and give directions verbally to anyone near the holotank. During the Fall of High Charity, Cortana entered one to aid John-117's passage through the city, remaining there long after the space station was transformed into a Flood hive. The Covenant also utilize portable holo-pedestals to communicate over distance or in the battlefield. The Luminaries mounted on Covenant ships are typically linked to the bridge's holotank, which can display the information detected by the Luminary. Cortana displayed on the Pillar of Autumn's holotank in Halo: Combat Evolved. A Covenant holotank in High Charity displaying Cortana's avatar in Halo 2. A holotank in Cairo Station's Firing Control. 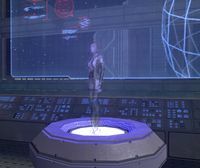 A portable Covenant holo-pedestal displaying a hologram of the Prophet of Truth in Halo 3. A hologram of the Prophet of Truth giving a sermon. The Prophet of Truth gives a sermon to Covenant troops. The Spirit of Fire's holotank displaying the Covenant shield on Arcadia in Halo Wars. Spirit of Fire's holotank displaying a diagram of Shield 0459. A large UNSC holographic table aboard the UNSC Say My Name in Halo 3: ODST. Carter-A259 using another type of holographic display during a mission briefing in Halo: Reach. Ardent Prayer's holotank displaying the planet Reach. A holotank in Dr. Halsey's lab underneath SWORD Base. Andrew Del Rio looking at a holotank displaying a schematic of the UNSC Infinity in The Commissioning. Cortana rising above her holotank in Halo 4: Forward Unto Dawn. Cortana's holo-sphere in the cryo-bay of the Forward Unto Dawn. Render of Cortana's holotank plinth in the Forward Unto Dawn in Halo 4. Roland on a holotank in Halo: Spartan Assault. A holotank in Halo 2: Anniversary. A disk-shaped holotank levitating inside a D79-TC Pelican in Halo 5: Guardians. A holotank aboard the Spirit of Fire in Halo Wars 2.